Nicely frothed with fresh dollops of yogurt, ripe mango, sugar, cardamom powder and heaps of ice cubes, this easy to make Indian Mango Lassi is a soothing delight. The best part is that it takes all of 5 ingredients and 5 minutes to make and you can make a vegan version too. Here is how to make Mango Lassi at home (Step by Step + Video). Beating the heat waves is the first thing that keeps striking your mind on summer days with some super cool drink. Morning, afternoon or evening, that one thing that you want to keep on devouring during summer days is a bowlful of Aam Ras or as a matter of fact anything that soothes your senses to core. Hence, come summer, and I make sure to keep jarful of fresh Kiwi Cooler, Cucumber Mint Cooler, Coconut Mango Cooler, Aam Panna always ready in the fridge. And of course, buttermilk is always served with every meal that I make these days. But, nothing beats the creamy, dense yogurt loaded, chilled concoction of yogurt that we all lovingly call Lassi during summer, right? Nicely frothed with fresh dollops of yogurt, ripe mango, sugar, cardamom powder and heaps of ice cubes, Mango Lassi is soothing delight that you must make and sip this season! Not only would it remind you of the royalty of North India but it would let you sip the best of both the worlds – mangoes and yogurt, ain’t that amazing? You can serve it for supper, as a dessert or along with meals, trust me, Easy Mango Lassi Recipe is super quick to make and is liked by everyone without a doubt. Write down its recipe and make it today? Lassi is a traditional drink made in North India, Punjab and Pakistan. It is made using fresh homemade yogurt and is flavored with cardamom, fruit purees, rose syrup or simply a few leaves of Indian holy basil. In earlier days, lassi was churned using a wooden hand head whisk and a nice froth would collect on top due to churning it. Now with ease of a blender, it’s very easy and quick to make equally delicious lassi within seconds. There are many variations, sweet and salty flavours of this drink and it can be varied by using seasonal ingredients as well. Mango Lassi Recipe is one such fruity, tangy variation that I am recommending to you today, friends! This mango recipe needs very few ingredients to make. Mangoes – Use the best quality to make mango lassi. The mangoes should be ripe and juicy. I prefer using Alphonso or Ratnagiri Hapus to make mango lassi. You can also use canned mango pulp if fresh is not available. The best mangoes to make Mango Lassi will be available in your nearest Indian store. There is no mango better than any Indian variety to make Mango Lassi and I really insist on buying the Indian variety to make Mango Lassi for best result. In fact the canned mangoes are quite delicious and gives a very nice flavour to the lassi so do not hesitate to use them. Try to get Alphonso or Kesar mango pulp to make this lassi. Yogurt – To make mango lassi, you have to add yogurt to it. Try to use yogurt that is fresh and not sour. Homemade curd works best to make this lassi but if it’s not possible, go for any plain yogurt that has not turned sour. You can also make mango lassi making greek yogurt. Just thin it a bit using some milk and you are good to go. Cardamom Powder – Avoid using packaged cardamom powder to flavour the lassi. You can crush the cardamom in a mortar and pestle and use it. Milk – If the yogurt is too thick, the lassi might turn out quite thick and heavy. You can thin it down with some milk. Sugar – Add sugar according to your taste. If the mangoes are very sweet, you might even skip adding it. How to make Mango Lassi Recipe using the Mango Pulp? To make Mango lassi using Mango Pulp, replace the mango cubes with 1 cup of Mango Puree and keep the remaining procedure same. How to make Mango Lassi without Yogurt? Lassi is essentially yogurt flavoured with other ingredients. If you want to skip using it, you can add milk instead but technically, it will be a Mango Shake rather than a lassi. How to make Mango Lassi without blender? 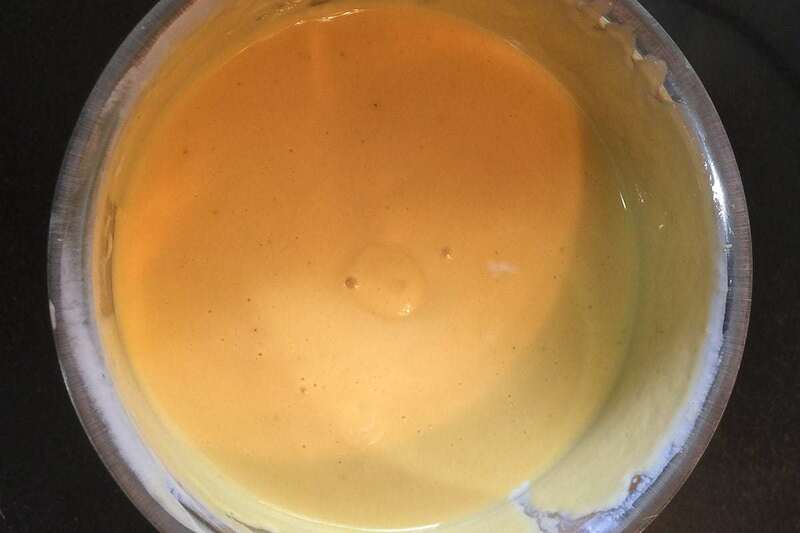 To make Mango Lassi without a blender, whisk the curd well using a metal whisk until is is smooth. Then add the mango puree and other ingredients and whisk well until combined. 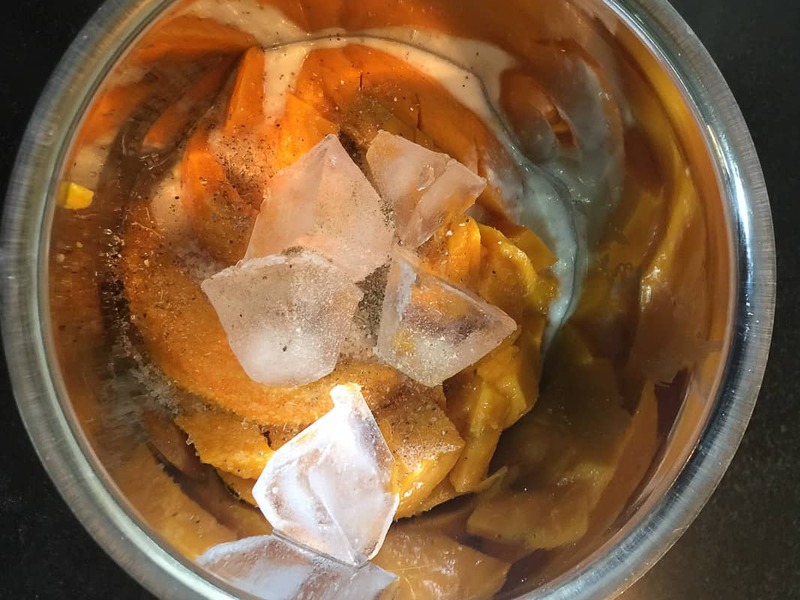 Can you freeze Mango Lassi? 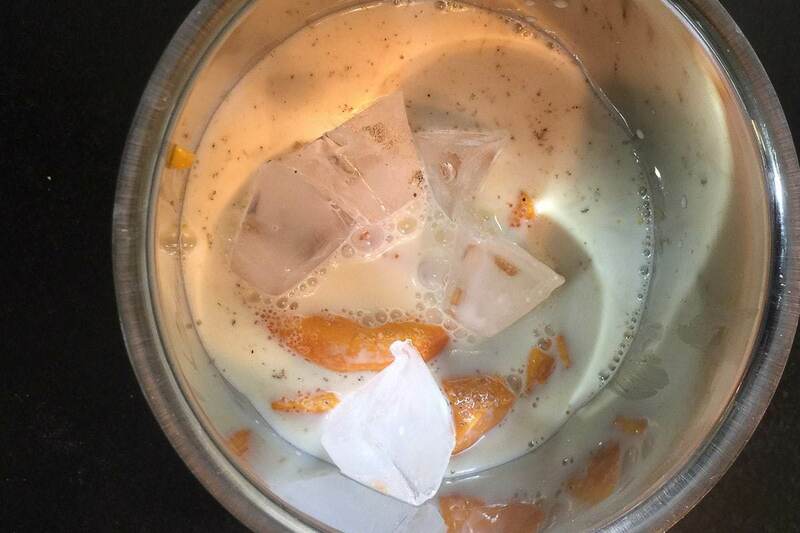 You can easily freeze Mango Lassi for 3-4 months. Transfer it in a freeze safe container and freeze. Wen ready to drink, thaw on the kitchen counter for 2-3 hours and then use. How to make Mango Lassi with Ice-cream? To make Mango Lassi with ice cream, add a scoop of mango ice cream while pulsing the lassi. You can also top the lassi with a scoop or two of vanilla or mango ice cream. 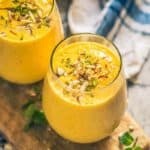 How to make Vegan Mango Lassi? To make vegan mango Lassi replace the regular yogurt with coconut or soy yogurt and milk with it’s vegan substitute. You can also use maple syrup instead of sugar if you wish to. Add yogurt, mango piece, sugar, cardamom powder and ice cubes in the jar of a blender. 3. Blend until smooth. Add some more milk if the lassi is too thick. Pour the lassi in serving glasses. Garnish with saffron strands, almond and pistachio slivers and mint leaves. Serve chilled. Nicely frothed with fresh dollops of yogurt, ripe mango, sugar, cardamom powder and heaps of ice cubes, Easy Mango Lassi Recipe is a soothing delight. Add some more milk if the lassi is too thick. Garnish with saffron strands, almond and pistachio slivers and mint leaves. Yummy!! I too make mango lassi everyday in the summer. It’s delicious :). No one can resist. Mango lassi was a big hit at home. Thank you for the recipe. I always used to make this with milk only, never tried it with yogurt. I guess today we are going to try this new variation at home 🙂 .